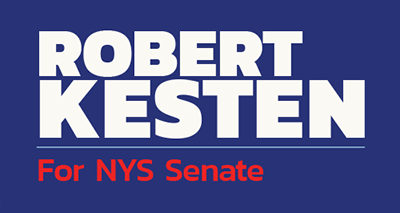 On behalf of its membership, the Board of Directors of Up2Us enthusiastically voted last night to endorse the candidacy of Robert Kesten for the New York State Senate in Senate District #40. A progressive Democratic candidate whose values closely align with Up2Us values, Kesten will be strongly supported during his campaign by Up2Us members knocking on doors, picking up phones and registering voters. “He will make a strong and committed State Senator” says Iris Lachaud, a member of the Up2Us Board of Directors. Kesten has deep local roots, interests, and experience here in Westchester County and has spent his career building coalitions and facilitating partnerships on the local, national and international levels. Raised in Bedford, Kesten is a graduate of Fox Lane High School (1973) and Syracuse University (1977.) Kesten currently lives in South Salem where he is a Lewisboro Democratic district leader and an active member of the Lewisboro Democratic Committee. “In the last three election seasons that I’ve known Robert Kesten, he has shown up, knocking on doors for numerous candidates including Ivy Pool now on the New Castle Town Board, County Executive George Latimer, and now Assembly Woman and State Senate candidate Shelley Meyer – he’s definitely committed to the Democratic process and progressive ideals” says Beth Sauerhaft, member of the Up2Us Board of Directors. Kesten has spent years as a Democratic party activist, having worked on the campaigns of the highly-respected Democratic U.S. Senators Tom Daschle and Paul Simon. He believes public education is fundamental to a functioning democracy and must be supported; economics and jobs today need forward thinkers taking into account the promises of technology and needs of human beings; unions, working people, government and business must work together to ensure a bright future for all; government must be transparent and open; and that there can be no compromise on clean water and air and we must put to bed the notion that economic growth is limited when we protect the environment. Kesten is also a strong supporter of common sense gun legislation. Since 2009, Kesten has been a consultant for PDHRE, an international non-profit organization promoting learning about human rights that leads to action. Prior to PDHRE he worked with a variety of nonprofits in education, agriculture, and the arts. Kesten will be facing a two-term incumbent Trump Republican, Terrence Murphy, who has proposed repealing New York State law designed at preventing the mentally ill from gaining access to weapons and eliminating universal background checks, opposes women’s reproductive rights and who has blocked important civil rights legislation. Senate District 40 includes the towns of Beekman, Pawling and the village of Pawling in Dutchess County, the towns of Carmel, Patterson and Southeast, and the village of Brewster in Putnam County, and the city of Peekskill, the towns of Cortlandt, Lewisboro, Mount Pleasant, New Castle, North Salem, Pound Ridge, Somers and Yorktown, the town/village of Mount Kisco, and the villages of Briarcliff Manor, Buchanan, Croton-on-Hudson, Pleasantville and Sleepy Hollow in Westchester County.